Just wondering if anyone would like to take part in a World Cup prediction league? I have a spreadsheet I'm running it from and can post updates on scores etc at the end of each day. Just for a bit of fun while the world cup is on! I only have space for 100 players (not that I think we will have that many take part but that's the limit! ), message me if you want to take part and I'll send over a prediction list. We will start with the group stage predictions all in one go along with best player and top scorer and once knockouts start it will require a little more updating from you on a regular basis. FATKOPITE10 is the first entrant, just waiting on predictions! Let nobody ever say our LFC prediction league scoring is complicated! You should have uploaded the prediction file to google drive or wetransfer or something for people to have a quick look at. And yeah it’s complicated alright but it’s all automatic. You can download this and fill it in. If you could sent it back to me via smithcraig9@outlook.com and include your username on the mail please! 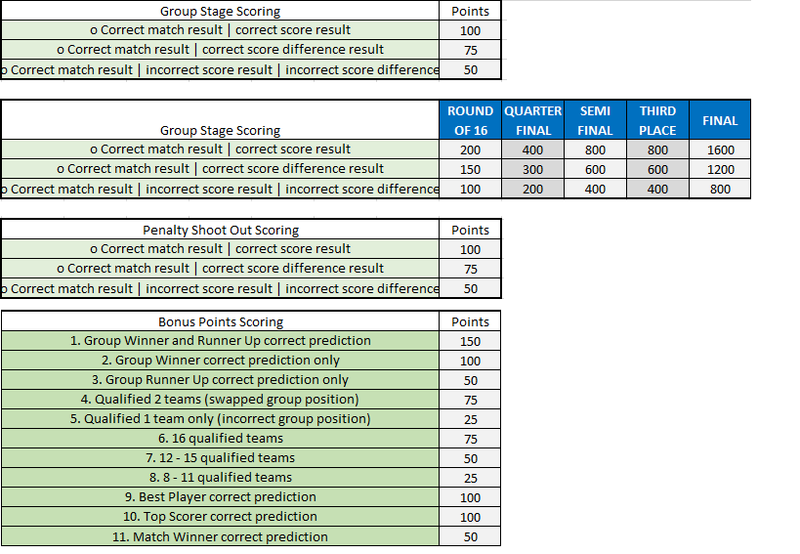 Once we know who's in the knockout stages I'll post new prediction sheets. It will be on you to have them over to my mail before the first game of each round of knockouts. I'll update accordingly when games end. In regards to frequency of updates during the group games I'll probably post it up within 24 hours of the last game of the day. Are we allow to do the prediction for group matches gradually or we have to do it all before the game start? Asking for it all in one swoop so it’s easier for me to manage. Only you and Clint at the moment though. you decide then if we should still run this. Had another sent in... I'll give it another week and see if anyone joins in late! Post in the thread of our official prediction in the Kop. The kop is for the club, not the World Cup mate. No, post the link to this thread on the prediction league.